The very first essay I wrote at USC was called “What I Saw That Day (9/11/01).” It was an essay I’d been trying to write successfully for several years but never pulled off, and I thought bringing it to my first non-fiction class and submitting it for workshopping would help to improve it. And I was right. Thanks to Madelyn Cain-Inglese and my classmates, I finally felt as though I’d written something worthy. I think that’s the only way I can describe it. So much has been (and continues to be) written about that day, and my feeling’s always been that if I don’t have something to contribute I’d rather leave the discussion to others. “What I Saw That Day (9/11/01)” was something I wanted to contribute to the collective cultural memory. I wrote “The Come Back” the first time I visited New York after writing that essay to my own satisfaction. In May, when I heard the news that American Special Forces had killed Osama Bin Laden, I started a new essay. I started it with the intention of posting it here, but it ultimately became something rather more. 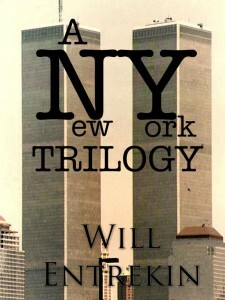 It became something of a discussion of how my life had changed after September 11th. And as it did, I thought it would be fitting to create a new book for Kindle. Something specifically honoring and chronicling that day and discussing my experiences and memories of it. So I did. Here’s the link. It’s a dollar. When I first published Entrekin, I dedicated a portion of its proceeds to charities, including the United Way and the Red Cross. I’m doing the same with this new collection. Somehow I missed this. I guess I know what I’m going to purchase…RIGHT NOW!